Conflicting information, some of it false, has been circulating regarding the situation on the territory of the Algonquins of Barriere Lake. We ask that those who wish to support the community be mindful of this, and be aware that the situation is far from simple. As events unfold, we are keeping in touch with a number of people from the community, including those we have worked with over the last four and a half years. At this point, after consultation with community members, we would like to make a few comments which seem helpful. 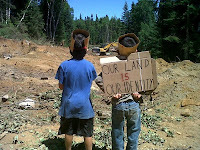 Beginning on July 4, 2012, the main harvesters of the Poigan Bay area, supported by the community, protested at the logging site against clear-cut logging by Resolute Forest Products. After two weeks of maintaining pressure against the company, they managed to get the government to agree to protect sacred sites, moose habitat, and other significant areas, under a process called “measures to harmonize”. A faction of the extended family members of the main harvesters did not want any forestry operation to proceed and decided to block the operations. The forest company, Resolute Forest Products, then filed a legal injunction to prevent the family members from disrupting the clear-cutting. The company was then granted a second request to extend the injunction to include anyone and everyone. This second injunction blocks the whole community from taking any action that might protect the lands from forestry operations over the coming weeks. There have been incorrect claims made on Facebook and on the Toronto Media Coop website alleging that community members “sold” land to Resolute and that they did nothing to fight the injunction. The community is taking whatever legal measures possible to fight the injunction, in fact, which is extremely difficult, because they don’t have the financial means to defend themselves and are raising money at the moment to support this cause. For clarification on the demands of the Barriere Lake community regarding Poigan Lake, please see an update from community member Tony Wawatie here. Tony's father is the main harvester of the lands being logged. It is important that MNR take further action to stop the damage that is underway. Namely, MNR should release the documents it agreed to provide to community members and implement the measures to harmonize process in a timely fashion, before other sensitive areas are destroyed. It will also be important for there to be continued pressure on Resolute Forest Products in the weeks to come. It is tragic that things have proceeded to this point, though unfortunately not surprising. We will post further updates as the situation evolves.